What is special about Tougaloo? Being the youngest of eight siblings, I am the first in my family to attend college. 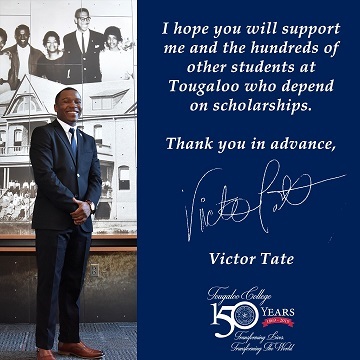 I chose Tougaloo because of its academic reputation. I had dreams that I was passionate about but didn’t know how I would achieve them. Tougaloo nurtured my dreams and helped shaped my passion. The transformative opportunities you don’t always get in the textbook, professors who believe in me and encourage me to pursue what I think is best, and connections that reach beyond the campus empower students like me to stay in school and earn their degrees. How are you funding your education? As a first-generation student, I rely on scholarships. There have been a time when I thought I would not be able to return to this special place, but thanks to scholarships, I am able to focus on my course work and not be concerned with how I am going to pay for college or pay off student loans. What best do you like about your major? I chose history as a major because I am passionate about changing educational policy that will make it possible for future students like me from disadvantaged backgrounds to pursue their educational dreams. Your gift today will have an immediate and lasting impact on students.